On Earth, erosion erases the craters of asteroid impacts in a few thousand years, so it’s hard to know how many asteroids impacted our planet at any given time. But the moon is different: there are no environmental processes like rain, rivers, ice sheets, or tectonic activity. The craters can last for a billion years. That’s why an international team of scientists looked at impacts on the Moon, which is (naturally) hit by asteroids at the same rate as the Earth over time. The lunar surface is full of craters from the asteroid impacts. In the image obtained by the Lunar Reconnaissance Orbiter (LRO) here, The South Pole-Aitken basin can be seen – a large lunar impact crater that lies on the far side of the Moon. At roughly 2,500 kilometers (1,600 mi) in diameter and 13 kilometers (8.1 mi) deep, it is one of the largest known impact craters in the Solar System and the largest, oldest, and deepest basin recognized on the Moon. The Lunar Reconnaissance Orbiter (LRO), a NASA robotic spacecraft currently orbiting the Moon since 2009, carries an instrument called “The Diviner Lunar Radiometer Experiment” which measures lunar surface thermal emission. In other words, the Diviner can measure the temperature of things on the lunar surface. In their work, with the help of temperature data from the Diviner, scientists used a new method to determine the ages of lunar craters. Large lunar rocks have high thermal inertia and remain warm through the night, whereas the fine sand particles (Moon’s crust is blanketed by a highly comminuted and impact gardened surface layer called regolith), lose heat quickly. The regolith of older surfaces is generally thicker than for younger surfaces. 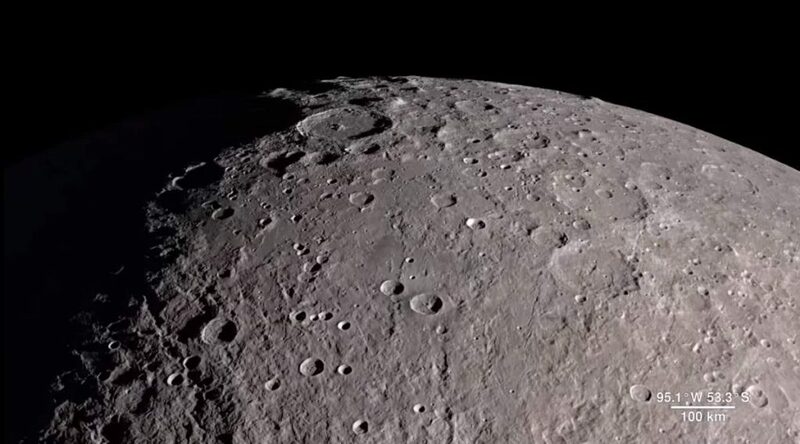 In other words, as craters get older, they become less rocky. Because, as time goes by, these large rocks get broken down by future small impactors. Mazrouei and her colleagues analyzed 111 lunar craters with diameters greater than 10 kilometers (6.2 miles) and younger than 1 billion years and found that the impact rate increased by a factor of 2.6 about 290 million years ago. The cause of this increase in the asteroid impacts is still unknown. Researchers suggest a collision or breakup in the asteroid belt could have flung debris across space in the Earth’s direction. The asteroid belt is the circumstellar disc in the Solar System located roughly between the orbits of the planets Mars and Jupiter. It is occupied by numerous irregularly shaped bodies called asteroids or minor planets. The video below, titled “Moon impacts converted into music” shows one billion years of moon impacts condensed into one minute, with larger craters producing louder and deeper notes. The sustained cello-like drone in the background is created by converting the elevation of the Moon’s entire surface directly into a sound wave. Scientists have recently been able to determine the age of 111 of the Moon’s larger impact craters that are younger than about 1 billion years old. Here you can listen to these impacts occur within 1 minute with larger craters producing louder and deeper notes. The sustained cello-like drone in the background is created by converting the elevation of the Moon’s entire surface directly into a sound wave. 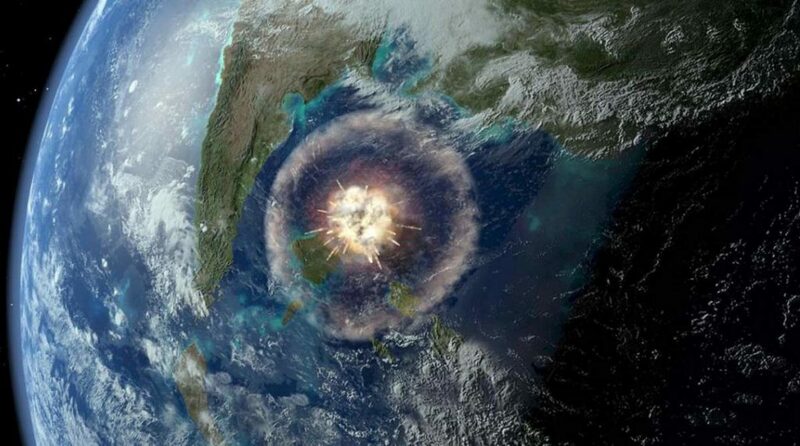 The Chicxulub impactor was an asteroid or comet at least 10 kilometers (6 miles) in diameter. Around 66 million years ago, it impacted a few miles from the present-day town of Chicxulub in Mexico, at around 64,000 kilometers per hour (40,000 mph). The impact has created a crater (Chicxulub crater) more than 180 km (110 miles) in diameter, making it the third largest known impact crater on Earth. The impact triggered a chain of events what it is known today as the Cretaceous-Paleogene (K-Pg) extinction event, also known as the Cretaceous-Tertiary (K-T) extinction, and wiped out three-quarters of the plant and animal species on Earth, including non-avian dinosaurs. The findings of the study are also compatible with the terrestrial impact record, which shows a deficit of large terrestrial craters on Earth between 290-650 million years. The new study showed that it was not a not preservation bias, but a reflection of a distinctly lower impact rate. Researchers also discovered that the terrestrial impact record showed a dramatic cut-off in the number of terrestrial craters: most craters older than 650 million years are lost. This may indicate a massive global-scale erosion event near that time, and also can be further evidence in favor of the Snowball Earth hypothesis.